Looking for fun and bright-colored baby clothing that’s also organic? Zutano, known for outfitting tots in punchy colors, recently launched its first 100% certified organic cotton collection for newborns up to 3 months. Two new patterns, the woodland creature themed ‘Forest Fun’ and the soft, floral and feminine ‘Meadow Marsh,’ are inspired by the very landscape that choosing eco materials is working to preserve. 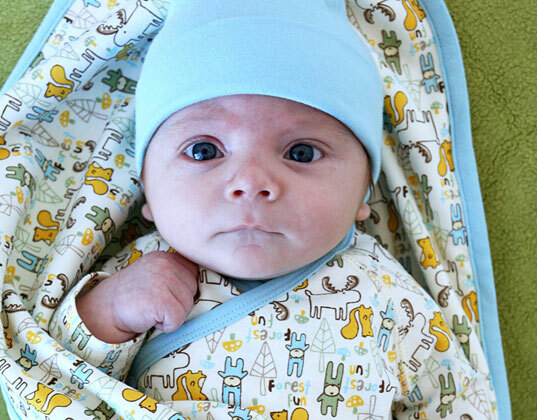 In celebration, Zutano is giving away a $150 gift certificate to shop the organic baby line. Find out how to enter to win after the jump. Here’s how to enter to win a $150 Zutano gift certificate! 3) Add a comment to this post with your answer to the following question: What inspires you to protect the environment? Bonus points for unique answers! Contest ends Tuesday, November 16th, 2010 at 12 midnight EST. Winner will be announced in the following week’s newsletter! I love nature and the outdoors.... we camp often, and whenever we travel, we search for places of natural beauty. It'd crush my heart if no one cares about the environment! I guess this answer isnt going to be unique, because what inspires me to protect the environment is simple- my kids. My baby has bad eczema and it would really help him to have more organic clothes. Buying organic is not only great for his skin but also good for the environment. If we don't take care of the environment now, there will be nothing left for our children and our children's children to enjoy. Being outside and enjoying our beautiful earth is what inspires me to protect the environment. We are living in world of limited resources and we will not have the beautiful nature to appreciate if we do not start taking better care of it! I'm also due in April and am looking for eco-friendly clothing, furniture, diapers etc! Better for my baby, me, AND the earth! My niece and nephew inspire me! i am inspired by my every day surroundings to protect the environment. As a sixth-generation organic dairy farmer raising my seventh-generation baby boy I find myself immersed in the beauty of this land that my family has farmed since 1868...my love and commitment to its pristine state keeps me determined to learn and nurture everything within me to live consciously. It's beauty is almost intoxicating, the air incredibly fresh, and i wish nothing more than to pass this intoxication along to my baby. What inspires you to protect the environment? We are all part of the environment and the living things around us. The more we do to preserve the beauty and life around us, the more we preserve our own health and happiness. Education. It's easy to assume that the products that we know and have long used may not be environmentally friendly or downright toxic. Recently, I discovered Inhabitots and the articles inspired me to do more rigorous research on the products we buy for our baby-to-be. I'm inspired to protect the environment every day at work. I work for an ocean environmental organization, and have spent the last 11 years of my life working in public relations for various other national environmental organizations. My job is all about inspiring others and changing attitudes about the environment, whether it be telling a reporter about a story about restoring our coasts, or holding an event to highlight the fact that conservation creates jobs and supports the economy. My life is dedicated to helping others understand exactly what is going on with our environment and how we can all make a difference together and indivually. Lately, I've been working on the Gulf oil spill recovery - it's a slow road, but I wake up every morning hoping to share this disaster's messages with new people who may not know. I'm in environmental communications/public relations. I've been inspired for the past 11 years to inspire others to take care of their environment. Right now, I work for a national ocean conservation organization, but I've also worked for several others in the past. Whether its pitching stories to the media about habitat restoration or holding a volunteer event to plant seagrass, I wake up every day ready to change behavior and inspire others. It's important to do what we can - we only have one Earth. Now that I have a five month-old, I find myself thinking about her future and how I might inspire her to take care of our planet too. What inspires me is simple --HOPE. I hope that the same backyard, trees, campsites, and outdoor activities are available for my kids as they were for me and my parents and grandparents. My 3 month old daughter inspires me to protect the environment and think green before making purchases everyday. I want her to grow up and see the world as I knew it when I was a child. It's because of her that I've made changes my day to day habits and choose to live a "greener" lifestyle. Children and nature itself inspire me to take care of the environment. It's difficult to watch beautiful, natural places being developed and changed to accomodate humans. Mother Nature does a fascinating job changing things all on her own. I've been teaching children about nature and the environment for 15 years. They truly care about the natural world and they're really good at teaching their parents.When I recycle or buy in bulk, I think of my daughter's future. My children. Starting them out with the right kind of attitude and not having to "unlearn" the harmful things people do to the earth, so being environmental is just the obvious thing to do for them. my wanting for the earth to be as safe as possible for my children inspires me everyday to make it a better place. Once I got it in my head how important it was to maintain the nurture/nurture cycle we have with the earth, it's more of an obsessive compulsion than anything else! I simply MUST recycle recyclables, MUST make purchases that support this cycle and the support and insight of like-minded friends - and the ingenuity of some of the great information & product sources - makes for all the more inspiration to do so! My husband and I met rock climbing and it is a love we want to share with our kid - protecting the wild places where you can climb (among others) has way more meaning now that we are looking forward to sharing it with our little one. the environment itself! it's a gorgeous fall day today - in the 50's, leaves rustling, sunny. and a few days ago it was the perfect slightly cold, cloudy, rainy day demanding a cup of hot cocoa. how wonderful that we have such variety, all of this earth! i'm determined to keep that available for my daughter. it would be so sad if she only knew of this through photos and recordings, instead of being able to know it first-hand. I protect the environment for our future. I want my children to be able to enjoy the outdoors like I have been able to. My great-great-grandchildren inspire me to maintain what is beautiful and fragile about our earth and try and salvage what we are losing repair what we've damaged. My son inspires me to protect the enviornment. I know that if I currently don't take steps to protect the enviornment every day, then that neglect will be compounded in the future. Conversly, if I take steps now, then that will also reflect in the future by preservation of the simple, pure beauty of nature. Also, children learn by example and what better way to educate my son about Mother Nature than take steps every day to protect the enviornment daily. After my lavish baby shower, and an abundance of gifts, I soon realized half of what was gifted to us, wouldn't be used. The guilt was heavy. It was then that I realized how little we actually needed. Who needs toys when your kid plays with dirt and rocks in the backyard? When I became pregnant with my 2nd child I was inspired to do things differently. We opted for a "sprinkle" where close friends and family contributed to the "baby miles fund". We used that cash on craigslist, ebay and at consignments sales. I even found brand new fuzzi bunz on craigslist! We are making strides and saving tons of cash, living live much more simply, and protecting the environment and our chlidren's future at the same time. I'm inspired to protect the environment for all people - now and in the future. We depend on environmental services (clean air & water, food, medicinal herbs, etc.) in so many ways and I think that many people don't realize that the Earth will survive just fine, but humans may not. I ? zutano and the fact they are a Vermont based company = ??. What inspires me to protect the environment is the awareness and realization that the earth and all the different species that inhabit her are connected. It is an extension of the human experience. Another important factor is my 3 year old daughter. I want to model what it means to be a good steward of this earth. The fact that my daughter will be the one to inherit this earth is what inspires me the most to 'be green'. I am constantly reminded of the Native American wisdom that with each action we take we should think of how it will impact the next 7 generations. Why would I want to leave my children and their children's children with anything other than a magnificent, healthy, vibrant, peaceful earth to cal home? The kids really inspire me to protect the environment! I would like to leave the world in a better place than when I found it, so that inspires me to plant native plants, eat local and try to eat less meat. It's great seeing the world through their eyes. Spending time outside each day inspires me to keep the outside beautiful. I'm inspired but my children, my children's children and their children afterwards. I want to be able to give my young son what he needs that is safe, chemical and pesticide free. I want the furture genereations well after me to be able to enjoy the world and nature, as I remember it. I shop at the farmer's market, and if not search out local or organic at the grocery store. We only use natural products in our hosehold, from dishes too laundry, to soap, toothpaste and deodarant. I want my son to be able to grow up without over 313 chemicals usually found in a child's system by the time they are two. Just this week while having to change to a big kid bed I spent 3 days online looking for something eco-friendly and organic. Being in Nova Scotia, Canada makes it hard to find the products I want to use. So instead of buying something from China close by, I opted for the extra 200$ shipping tag. I still know it's made in Canada, but I also know he'll have it for years to come and not have to worry about the off-gases a normal mattress would produce. What inspires me to protect the environment is knowing that every little action reaps a great collective reward. Our little choices influence others to think more critically about their own choices. If we were to all take simple daily actions to be eco-conscious the paradigm would shift to a greater social eco-involvement. I never doubt the influence of one person's ability to effect change-- and if you do consider the power of a single mosquito in a closed room! I think that what inspires me most is the fact that I grew up in nature playing along a creekbed in a pretend playhouse made up of tree stumps and such. I want the same for my children. compassion for all beings. i don't even like to kill ants! yet with my modern lifestyle i'm indirectly responsible for so much death and destruction, it breaks my heart when i really think about it! do my best to minimize that. My baby inspires me. She is so pure. I would love for her to live on a safe and healthy planet Earth. We need to show the Earth lots of LOVE. When I go home and I see the beautiful mountains. Any time of year. The trees--green, grey, or multi-colored. The tall, protective stance. I love those mountains, and I want my baby to grow up and be able to share the beauty of them, and the rest of nature, with his children and grandchildren. The knowledge that God created this world. We are to enjoy it and respectively maintain it! Pretty simple, but not at all unique. My baby girl. The vivid memories I have from being a kid are mostly from the outdoors......the beach, creeks, parks, etc. I think about sharing them with my kids and I know that they have all changed.....either they aren't there anymore at all, or they are very deteriorated. There aren't many places that are still intact they way I remember them. I want to protect what we are experiencing now, so that we have solid places to make memories throughout their childhood and beyond. My daughter is what inspires me to protect the environment. It began by wanting to protect her. So I bought organic foods, organic clothing, switched to non-toxic cleaners, began composting, started recycling pretty much everything we use, and started a bunch of research. After I learned that even though I was protecting my daughter (as much as I could) there were still dangerous chemicals everywhere that I could do nothing about. So, I now try to teach as many people as possible how they can help the environment by cutting down on waste, using non-toxic materials, and buying local organic foods. The more people that catch on, the healthier our planet and children will be! I've always been environmentally conscious, but becoming pregnant added a whole new level to my awareness. I started looking at all my habits and thinking about which ones I wanted to pass on as is, and which ones I could do better on... there were some things I did out of laziness and some things that were ingrained because I learned them that way myself - that I wanted to change for my child. So I've been on a rampage to rid myself of bad, not-earth-friendly habits before the baby comes. It's worth it! This is easy for me to answer. I tried so hard to teach my kids to that they were stewards of the planet and they kept telling me what difference can one home make. None of our neighbors recycled so how can it help if we do. I told them you can change the world in your own back yard and set out to prove it to them. I went to our local school district and started talking to them about setting up a recycling program. I now run that program and have done so for the last 12 years or so. We diverted over 58 tons of garbage to recycling centers in the last year alone. This program has helped saved the planet, set an example to children that they can change the planet, make a difference; and saved the school district $200,000.00 in 2010. The fact that whatever we leave behind is left for our children to clean up or take care of. I also feel it is important to teach our children now to take care of our earth. my grandson, and my future grandchildren and on an on. Leaving things as natural as possible and not polluting the earth and our food with toxins and things that are making people ill. It all goes together with treating each other the same as we would want to be treated, same goes for mother earth! My desire to protect the environment comes from so many of the same reasons that most of us would say. On a personal level, my wife & I spend a great deal of time outdoors - hiking, swimming, walking, etc., and I have done these things my entire life, thanks to my parents, who took us camping, fishing, etc, regularly, & taught us to cherish & respect those surroundings. I do not want to see the degradation of our surroundings continue to worsen, as it has for many years, and think about everything from a very interconnected perspective - we are tied to each & every aspect of our environment, and any harm done at one level is sure to cause an effect throughout the system. Then, I think of my daughter, who I also want to have the same experiences I have, and more, & I get very anxious thinking about the abuses that we as a society inflict on our surroundings, potentially causing that to be impossible. Overall, no matter how selfish someone may be, it makes the most sense to take care of the environment, even if just to make one's own life more tolerable, but ideally, we all need to consider the other life-forms on the planet, whether human or not, and do whatever we can in order to preserve a safe and healthy place for each of them. It's so hard to be unique when my sentiments are very much the same as everyone else here, which is really great to know so many mothers out there are protecting their kids and our environment at the same time. What truly inspires me is being out in nature and I can't wait to bring our little one to sit under a tree on a patch of grass or feel a cool stream or listen to the wind blow. All those things that make living in the moment and makes us feel connected to everything. My four month old. My husband. My family living in Beijing where the pollution is so much worse than here. My faith--if we can't love and protect the environment, can we really love and protect each other? my children and grandchildren and generations to come. Gratitude. Protecting the environment is about believing in something bigger than ourselves and being humbled by that. Who would not want to protect this beautiful home? This world is the one common thing that unifies us all. People, animals, creatures, plants, we all need this world. We owe it to this planet, and to ourselves, to take care of it and respect it. Its destruction would only be our own. I ADORE this company and their thoughtful designs! Of course my daughter inspires me - but before she was here - the roots of my green motivation stem from my desire to simply feel human. I feel most "human" when I am learning where my food comes from, how products are derived from raw materials, and continuing to discover the ways that I fit into the larger cycles of this universe. My childhood memories of spending time in nature inspires me to protect the environment for my children, and someday-future grandchildren. My one year old daughter inspires me. Teaching her is to respect, love, and have compassion for every living thing in our environment is very important to me. I do things like compost, recycle, buy organic, support local businesses as much as possible, and foster animals until we can place them in loving homes. It's important that she sees us doing these simple things from day to day. Also, with all the fast food advertisements aimed at kids on TV, I want her to understand where real food comes from. We community garden and buy most of our produce from local farmers that we have gotten to be friends with. I want to ensure my children can enjoy the splendor of nature everyday like I do. We already take our daughter camping and can't wait to take the new baby. It is a wonderful way to show them all the wonders of nature and how to be a good friend to it. My family inspires me to protect the environment and the hope that I can leave behind a better place for my children, their children, their children's, children, etc. My children and my respect for this planet as God's creation. I'm inspired by dirt. I regularly take my children to Prospect Park in the middle of Brooklyn. My boy likes to dig and the babe likes to put everything in her mouth, but every time they move to do so I wince. I know the dirt is not the good clean dirt that I experienced as a child, living in a place that did not have hundreds of years of industry and use. So I long to give my children dirt. Good clean dirt. What inspires me in protecting the environment? MY answer is quite selfish. I would like to eat _normal_food. This requires clean soil, air and water. What really inspires me to care about the environment is not just my children, but my children's adoration for everything that surrounds them. My three-year-old asks to bring in every piece of nature she finds from a 'rainbow leaf' to a stick bug who might get cold in the night. She has such a passion for the simple beauty that surrounds us. My four-month-old son will sit and stare at the trees blowing in the wind for hours. To hear him giggle as grass tickles his toes is just bliss. Who wouldn't want to save and treasure something that excites and awes their children? And what about my children's children? I dream one day of splashing my tiny grandchildren's toes in a clean ocean. I'm inspired to protect the environment based on the theory of community and future generations. The idea is that we leave the planet with as many resources as we had when we were born. Trying to live in harmony with the environment is inspiring. It is also challenge to design a system that is a cycle. Everything in nature is in a cycle, and humans are trying to realize that and include their waste in the cycle of life. Someday that cycle will come full circle for us. I am inspired by my children. We teach our girls to recycle and protect our environment. We enjoying talking hikes and I try to teach them that the Earth is here for us and we must protect it. I'm inspired to protect the environment because my parents are trashing it. They drive a gas-guzzling vehicle, aren't careful about what they eat or where it comes from, and generally disregard anything environmentally friendly. I'm really not trying to be spiteful of my parents, but every time I think about throwing away something that could be recycled out of convenience, buying a stash of disposable diapers so I can be selfish and have a laundry-free day, or let the water run in the shower while I'm washing my hair instead of shutting it off, I remind myself that I have to counteract how the rest of my family behaves for the benefit of future generations. My baby on the way! I want him to enjoy nature and ensure there is a future for his kids too. As a student studying architecture, I know all too well the role I can play in the future of this planet. I have always known that I have a responsibility, but what really crystallized it was a discussion I had with an architect from Germany who now lecturers at my uni. He was so full of enthusiasm and energy, and has played a vital role in advising governments all of the world about what they need to do over the next 30 years to adapt major cities to become more sustainable and combat issues such as urban sprawl, something I honestly had little understanding of before talking with him. What inspires me is that memory of fresh air that I used to enjoy when we went away in the summer to clean, open spaces. I want all kids present and future to have that anywhere they go. Smog and pollution and lack of quality air and food products due to overproduction and over consumption is not unacceptable! subscribe, like on FB My children inspire me to protect the environment. I know that it is our job as parents to teach them how to be stewards of our planet--it's a challenging task but one of our most important ones! My new daughter definitely inspires me to leave a better planet for her. A healthy planet makes healthier people. What inspires me to protect the environment: The most obvious answer is my family - my children - my loved ones who I wish to see grow up to be healthy functioning well-adjusted adults. I look out for the planet's future as it were. We live at such a critical point right now in history. My parents, aged in their 50's, are late baby-boomers who live with a indulgent sense of middle-class entitlement and are worry free of resource demands or consequences. In a world dealing with climate-change and the slogan of Reuse-Reduce-Recyle, I grew up believing that respecting our earth and living within the mean's of the planet's natural flow of resources was the only way our species would be able to continue growing without dire consequences. As I start to build my own family, I know that this rising generation holds the combination of the scientific & technological know-how as well as the perspective of globalization that will be necessary to shift our societies away from fossil fuel energy & neurotic disorders of over-consumption. Everyday I am aware of my interactions with the environment and the ripple of consequences each of our decisions plays in the large machine of ecological balance. In my awareness I help my children to understand that everything we do comes from something and leads to something - from: high beef diets, leaving on the tap water while brushing our teeth, the use of cars to get everywhere, to the types of clothing we buy or support. It is a delicate balance to make them aware but not scare them - the world is already full of enough fear. By using creative examples to show them how to accept the world they are being given. In my household we watch a lot of You-Tube videos on how to up-cycle or re-cycle with everything from arts & crafts projects to home gardening. The internet is full of inspiration! I am inspired b/c of how much I enjoy the outdoors and I am inspired by this world's physical diversity--and I want my children and future grandchildren to have the same happy outdoor childhood memories that I have. I am inspired to protect our planet because if we don't, who will? I want our children and their children and their children and do on to have a wonderful place to live. This earth was created beautifully and perfect. We should maintain that! What inspires me to protect the environment is taking a look at our past. We've come so far in technology and modern ways that most people seem to forget what's really important. You can have all the cell phones, gas and transportation, computers, ect, but none of that is going to matter without clean air, water, or safe food to eat. I try every day to remember the simpler times, and not take it for granted that I do have clean air and water, and a choice to eat foods that have not been genetically altered. And I hope that my small steps that I take everyday will make a small impact in the future. The thing that inspires me to protect the environment is remembering the passionate love for the environment I had as a child. I think this can fade as we become adults with lots of other priorities and jobs, but retaining that childlike love of and concern for the earth seems key in my case. My futur child inspire me ... i just wanna let him a bette world ! My children inspire me to protect the environment; a desire to preserve the world for those who come after us. And to serve as role models as stewards of our planet. My oldest son (4 years old) is obsessed with animals. His favorite animal is a Rhinoceros, and wants to be a �wild animal veteran� when he grows up. Every day at bedtime he asks me when we can go to Africa and see a wild Rhinoceros. I promised to take him on an African safari for his 16th birthday. It will break my heart if there are no Rhinos left in the wild in 12 years for him (or anyone for that matter) to see; therefore, our family does what it can to help conserve environment. My grand children and the effects it will have on the future generations inspires me. Now that I'm pregnant with bub everything around me seems fragile and easily damaged. I feel that I want to preserve all the great things about life so that my baby will see, experience, feel and enjoy everything I was able to. The environment is a BIG factor in this. And so my contribution to the world inspires me to preserve it for him. Gotta fight for the future, otherwise what's the point? It's the only home we have and we need to remember that despite the entire vastness, emptiness, and all of it's infinite glory in the universe, this little pale blue dot is ours. I became inspired to protect the environment when my son passed away at 3 months old. We were not sure what happened, but I did a lot of researching and investigating about what could have happened. I am proud to say that I am not only a proud mother of a 100% organic 6 month old girl, but I am an early childhood education provider that advocates for your children too. Being organic not only helps our environment, but our health. The brain of a child three and under is growing rapidly and the effects of chemicals, pesticides, insecticides, herbicides, preservatives, additives, and several other synthetic substances can hinder this development and raise the levels of toxicity in their and our bodies. It is time we become aware of this and reclaim the simplicity and beauty of organic nature. I do not know for sure that my son passed away because of chemicals, but with growing evidence, it appears as though this was more than likely the case. Let's be preventative before we have to get reactive. What inspires me to protect the environment is the thought of certain plants and animals not being around. When I was in kindergarten I was obsessed with the dodo bird being extinct (I have not idea why I was fixated on this creature I just was). I don't want to lose anything else. My kids inspire me to protect the environment! I was initially inspired when I saw how easy it was to make small changes - replace lighbulbs, recycle, reuse, buy thrift items .... now I'm getting inspired by challenging myself to make bigger changes for my future children and grandchildren. My kids definitely inspire me to protect the environment. I love seeing them play outside and interact with nature and I only hope their kids can too. Before I had a child I would barely do my share on protecting the earth. But when I started traveling the world and had my first son, I stopped to realized how beautiful the world is and how I need to do my part to ensure it stayed beautiful. I want my child and other children to be in the same beautiful world that I grew up in. I volunteer my time at the local recycling center as much as I can. We use alot of organic products and recycle every single thing in this household. I subscribe to your emails I like you on facebook I am inspired to help out the environment when I go camping or hiking in a beautiful place it makes me want to preserve the natural areas we have so that others can enjoy them in the future. I've done 1), 2), and my answer to 3) is that I'm inspired to protect the environment for the benefit of my family and community. Over the last year I've taken many small steps which add up (composting, gardening, recycling, joining an organic CSA, buying less). I'm inspired when I see how easy and rewarding these small steps have been. My daughter inspires me to protect the environment. I love nature and what would we do if all the trees were cut down? I'm happy to know that I recycle and cloth diaper and MAYBE I'll make a difference on my own. I' trying to make a difference. I subscribe to your emails I like you on facebook I am inspired to help out the environment when I take my dog to the dog park & there are so many sweet dogs out there running free & happy & simply loving nature & each other. The earth is such a gift-- our greatest blessing aside from our physical bodies. I treat the earth well because I want to show gratitude to my Heavenly Father for the blessings he has given me. Life is all about love, loving ourselves, loving each other, loving the earth. Also, I want to leave the earth a better place than I found it for my children and grandchildren. I want to be an example to them of love and gratitude! what inspires me to protect the environment?? common sense. what inspires me to protect the environment? common sense! When Fall comes near the crisp breeze rolls in and the leaves start to Fall inspire me to protect nature to its most raw and beautiful form. The environment gives us a home, food, resources, beauty and life. Without these, we have nothing. My belief in humans. That they finally figure out the world is not something that's easily to renew like your car or house. That you have to respect it and make your impact as small as possible, so future generations can enjoy and love all the wonderful things like we do now (or just take it for granted ;( ). Open your eyes people! I love home and family more than anything, and the earth is our home and its where my family lives and will live long after I'm gone. I see the environment going downhill every day and it makes me so sad, I wish more people realized how important protecting it is. I believe we where put on earth to take care of it and the creatures that live on it in addition if we don't take care of our planet Our children and their future children won't have a beautiful place to live and grow so I care for all of those reasons. Looking for fun and bright-colored baby clothing that's also organic? Zutano, known for outfitting tots in punchy colors, recently launched its first 100% certified organic cotton collection for newborns up to 3 months. Two new patterns, the woodland creature themed 'Forest Fun' and the soft, floral and feminine 'Meadow Marsh,' are inspired by the very landscape that choosing eco materials is working to preserve. 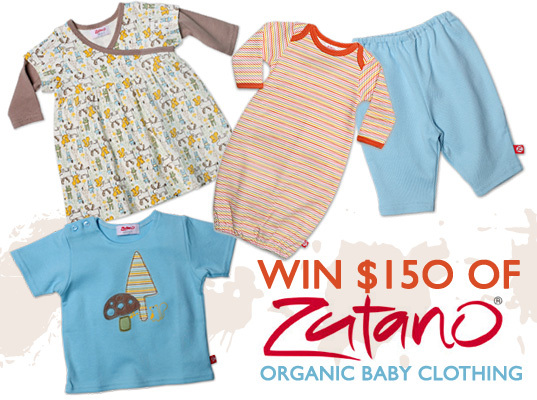 In celebration, Zutano is giving away a $150 gift certificate to shop the organic baby line. Find out how to enter to win after the jump.